Although the Jewish religion cares more about practices, they have a few beliefs. The Jewish religion has only one God named God. He is known to be the master of the universe as its creator for everything. Jews believed that Moses was sent from God to lead the people and Messiah to be the savior for the people. The jewish religion also believe that human beings have a special role because humans are created in God’s image and have the ability to will, speak, and create. Judaism prioritizes orthopraxy, meaning correct practice, over orthodoxy (correct belief). Many of the practices come out of the bible. Aside from the Ten commandments, Jews follow addition laws and specific customs that deal with time, food, and prayer. Weeks, months, and years have their devotional rhythms, which are establish by these laws and customs. The purpose of all laws is to recognize God’s presence and human life. The Sabbath day takes place on the seventh day of every week - it is a special day. The purpose of the Sabbath is to bless the entire week and rest after six hard days of labor - just as God had spent six days creating the world. The traditional purpose of the Sabbath was to allow everyone - including slaves and animals, regular rest. In earlier days, fires could not be built on the Sabbath because of the labor necessary to create a fire. 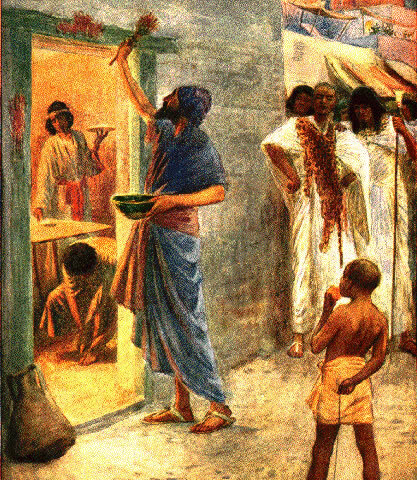 In order to avoid small, but necessary, acts of labor on the Sabbath, it was common that one would prepare food beforehand or eaten uncooked. The Sabbath day is intended to separate the everyday world of labor from one day in order for everyone to enjoy leisure. The Jewish religious calendar is lunar - meaning that each month belongs with the new moon. Adjustments can be made in order to keep the lunar years in sync with the solar calendar. Twelve lunar months consists of 354 days, compared to 365 days in the solar year. An extra month is added to (about) every three years. The lunar months of the Jewish year vary, along with the holy days. Rosh Hashanah meaning “head of the year” is New Year’s Day. A new year begins at the end of harvest season, when all debts can be paid off. The religious New Year occurs in autumn (late September or early October). The New year period is ten days and called the High Holy Days, which ends with Yom Kippur (“day of covering”). Yom Kippur consists of fasting, prayer, reflection - intended to cleanse people for the upcoming religious year. 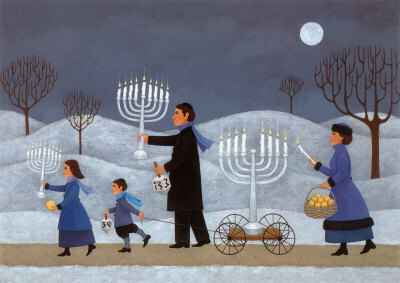 The eighth-day the Jewish celebrate is known as Hanukkah, which means “dedication” in Hebrew. It commemorates the rededication of the second temple in Jerusalem where according to legend Jews had risen up against Greek-Syrian oppressors in the Maccabean Revolt. Because the Jewish calendar is lunar, Hanukkah does not have stable date but usually falls in November or December. Hanukkah is often known as the Festival of Lights and is celebrated with the lighting of the menorah, traditional foods, games and gifts. One of the Jewish most sacred holidays is Passover. It commemorates the story of the Israelites’ departure from Egypt. According to legend, when Moses goes back to talk to Pharaoh, Pharaoh does not let the Hebrews go which causes the Hebrew God to unleash the 10 Egyptian Plagues. One of the plagues was to slay the firstborn son by an avenging angel. The Israelites who marked their doorframes with lamb’s blood the angel would recognize and “Passover” each Jewish household. Passover is often known as a Spring Festival and is celebrated with traditional foods and telling of stories. Judaism have always valued cleanliness and care for food. According to which branch of Judaism a person belongs to, is an indication of how they follow the dietary rules, whether it be to a greater or lesser degree. The word kosher means “ritually correct” and essentially applies to food preparation and consumption. When cooking meat, all blood should be drained before the meat is cooked and eaten because blood gives life and is sacred to God. Pork and shellfish are forbidden - they were considered scavengers, which implies that they are dirty and easily contaminated by what they ate. Traditional Jews do not mix meat and dairy products or eat the two in the same meal, also meaning that a household that follow kosher rules must keep separate sets of cooking implements, pans, dishes, and utensils - one for meat and one for dairy products. Some households go as far as having two separate sinks and refrigerators. Talit is a prayer shawl that is usually white with dark stripes and fringe. It covers the man’s head and body during prayer and symbolizes humility before God. When the prayer is not used, in less traditional forms, the yarmulke (skullcap) is used. Bar Mitzvah is celebrated when young man turns 13 and becomes an adult; it marks puberty. In some branches of Judaism, girls ranging in age from 12 to 18 are honored in a similar coming-of-age ceremony called Bat Mitzvah.